2016, thus far, has been a banner year for Kayfabe Commentaries. With the debut of new series like Raven’s Restler Rescue and Bombshells with Leva Bates, and classic additions to old favorites like the Timeline series and YouShoot, Kayfabe Commentaries has been on a roll. The newest series, however, “Gabe Sapolsky’s Next Evolution”, may be the best yet! In “Gabe Sapolsky’s Next Evolution”, Gabe Sapolsky, renowned wrestling booker, sits down with established stars whose careers Sapolsky helped shape, to take a look at their evolution from greenhorns to seasoned pros and the booking decisions behind the matches. In the first edition, Sapolsky is joined by one of the hottest young wrestlers in the world today and current WWE NXT Superstar Johnny Gargano to break down Gargano’s evolution as a wrestler through five of his most important matches from Dragon Gate USA (DGUSA) and EVOLVE. Now, in the interest of transparency, I wasn’t a big fan of either Gabe Sapolsky or Johnny Gargano going in to this DVD. While I’m not about to jump on either man’s bandwagon, I do have a newfound respect for both men after watching this DVD. The five matches highlighted here are all great matches that show just how far Johnny Gargano has come as a wrestler (particularly in terms of psychology) and Gabe Sapolsky as a booker. The first twenty minutes of the DVD is a sort of double shoot interview with both Sapolsky and Gargano asking questions of each other. The focus in the first part is how the two met and how Gargano came to work in Sapolsky’s new DGUSA, Sapolsky’s first venture after departing Ring of Honor in 2008. The chemistry between the two is the first thing that stands out; these two are good friends and have a massive amount of respect for one another. Their relationship comes across more as player and coach than best friends, which points to the real impact both men have had on each others lives. The rest of the DVD is devoted to matches. In terms of the matches, this is an incredible collection. All five matches are shown in their entirety, including entrances, with the original commentary playing very low as background music. Sapolsky and Gargano are visible the entire time in the lower right hand corner as they offer, essentially, director’s commentary over the matches. Throughout the matches Gabe Sapolsky talks about everything from booking the matches themselves to constructing the angles to make the matches pay off. Gabe gives unique insight into booking before and after, and how the post-match booking of a title change is just as important, if not more so, than the program that got them there. Johnny Gargano shines as an intelligent and thoughtful wrestler who truly cares about the sport of wrestling and the subtlety of psychology. Yes there are funny stories and great memories, plenty of them, as a matter of fact (including how Austin Aires nearly retired in 2011); but what comes through best is Gargano’s respect for the art of professional wrestling. A respect no fan could help but appreciate. The most fascinating parts of the DVD, for me, were the conversations regarding their historic tour of China in 2014. From the food and the hospitality to how Chinese fans watched wrestling from city to city (a sport they knew next to nothing about), the conversations are truly fascinating. The struggles both men faced in producing a worthy Gargano/Ricochet match for the fanbase watching on iPPV while still entertaining the Chinese fans are incredibly insightful. This DVD is, hands down, the best Kayfabe Commentaries release thus far in 2016. In actual fact I can’t recall seeing a KC series debut as strong as “Next Evolution” since the Mid-South Wrestling debut edition of “Back to the Territories” in 2014 (review here). 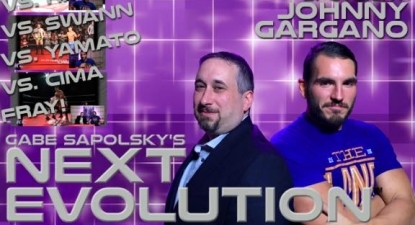 “Gabe Sapolsky’s Next Evolution: Johnny Gargano” will appeal to all fans from all walks of life who enjoy the inner-workings of the wrestling business, regardless of their exposure to Sapolsky or Gargano. At 2 hours and 26 minutes this is a true wrestling treasure frankly as good as anything WWE Home Video has produced in years, and a worthy addition to any wrestling library. KayfabeCommentaries.com has the new “Gabe Sapolsky’s Next Evolution: Johnny Gargano” DVD to add to your collection now! It can also be streamed instantly On Demand.